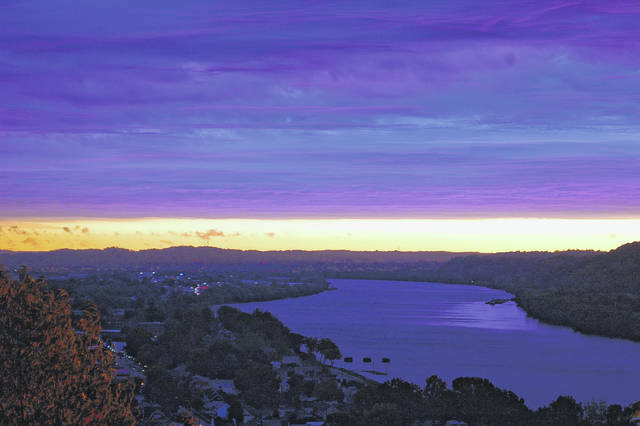 The view upriver from Mound Hill portrays the cloud cover reflecting deep colors in the morning sky Tuesday. The view from Mound Hill offers an excellent vantage point as the sun rises over West virginia. OHIO VALLEY — The skies over the Ohio Valley have been filled with more intense shades of red and pink in recent weeks, causing spectacular displays for those on the ground. While a fairly normal occurrence, many are not aware of the science behind this natural display. According to the National Oceanic and Atmospheric Administration (NOAA), this event occurs most often in the fall and winter due to the increased movement of winds during this time of year. The increased wind movements move haze and dust farther along creating clearer atmosphere for the sunlight to travel through. The reason for the change in hue happening during sunrise and sunset is a result of the angle of the sun’s rays passing through the atmosphere. Because sunlight is composed of a spectrum of colors, the air molecules in the atmosphere act like a lens breaking down the light revealing different colors at different angles: as famously demonstrated in Isaac Newton’s famous experiment with prisms. As the sun gets closer to the horizon, the sunlight travels through the atmosphere to the viewer for a longer distance, revealing more red and orange hues. This process is caused by the round shape of the Earth. While these views are certainly beautiful in a clear sky, clouds contribute greatly to the scene from the ground. With the fall weather, residents have experienced several weather systems move through the area with clouds that are above the atmospheric boundary layer where dust and haze are found. According to Stephen Corfidi of NOAA, these conditions result in spectacular skies because the higher clouds catch unfiltered sunlight and reflect it to the surface. This combination of cloud reflection and sunlight from near the horizon are often the subject of photographs. 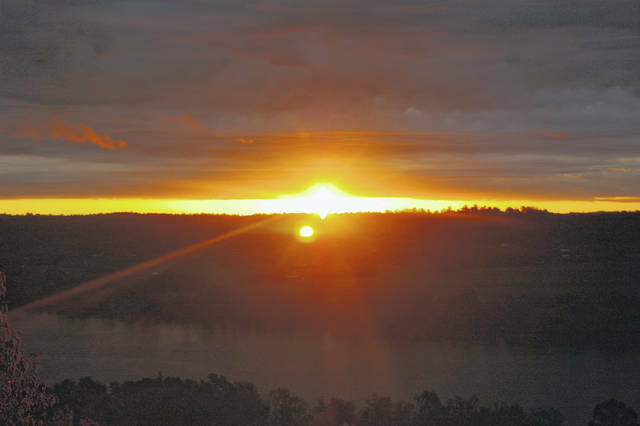 With a mix of rain and sunshine over the next few days, there are sure to be more sunrises and sunsets full of color that can be enjoyed from the ground. For Gallipolis, sunrise today will occur about 7:45 a.m. and sunset about 6:40 p.m.